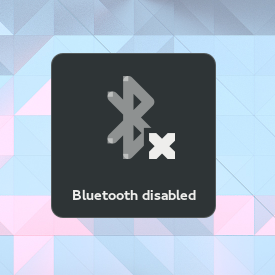 As we were working on audio jack notifications, and were wondering whether the type of notification we'd pop up in this case could be reused in other cases, I encountered a feature request that could now be solved easily with the rfkill D-Bus service we added to gnome-settings-daemon for the 3.10 release. 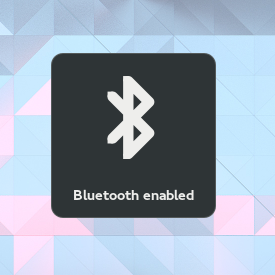 If you have keyboard buttons on your laptop to enable or disable Bluetooth, or Airplane mode, you can now use them. 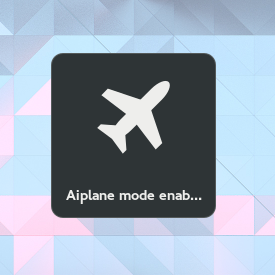 Note that the "UWB" toggle key will toggle the whole airplane mode mainly because no in-kernel driver uses it, and nobody remembers what UWB is. Note that the labels and icons used are still subject to changes. In particular as you can see that the labels are too long for lower resolutions. Could those labels word-wrap, or go wider? Even if you found a string short enough to not wrap in English, the strings for other locales may need more room. Did you mean "the 3.20 release"? @Marius: No, the 3.10 release was the first one with the rfkill D-Bus service, originally for the Bluetooth panel and system menu's benefit. I have a ThinkPad and the wireless key (F8) only toggles WiFi on and off. 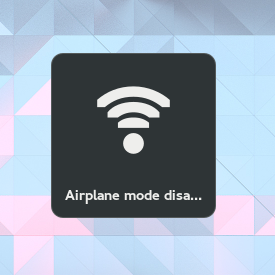 I would like it to be able to toggle airplane mode as I often fly. Alternatively a panel icon to toggle it work. At the moment you have to go into network setting to turn it on or off which is extra clicks. @Peter: Either you can change the meaning of the key, using udev's keymapping support, or very likely use the physical airplane toggle. All the Thinkpads I ever had had such a toggle on the side of it.